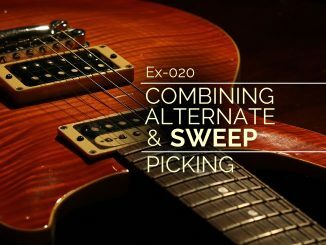 Practice switching strings while alternate picking with this exercise. 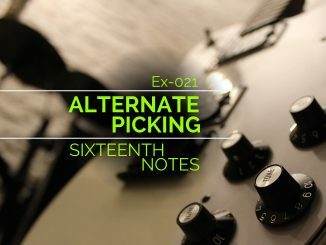 When practicing alternate picking, most people can quickly learn the basic motions (down, up, down, etc). The hard part comes when you switch strings and skip strings. 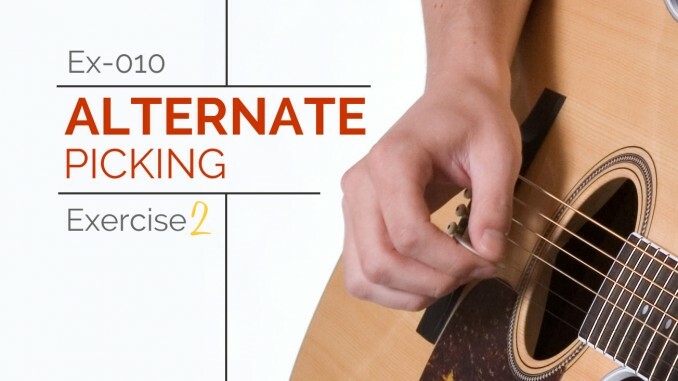 This exercise is designed to practice alternate picking across multiple strings. This is a lick based in D natural minor (D-E-F-G-A-B♭-C) with a C♯ note snuck in over the A7 chord creating a harmonic minor sound in the second measure. It’s played in eighth note triplets to smooth out any accents that occur from an even number of pick strokes. The first three notes of the exercise present another technical quirk. The D and A notes both occur on the seventh fret of the 3rd and 4th strings respectively. Barre these notes with your index finger, and rock back and forth to sound each note individually. Don’t let the notes ring together as they would in a chord. On an electric guitar, a great way to practice this idea is with a crunch sound. The distortion will highlight any area with more than one note ringing. Take your time to memorize the notes and fingerings, get the sound of it in your ear, and play it with a metronome or the backing tracks provided. Remember: strict alternate picking here! It may feel intuitive in spots to have two consecutive down or up strokes, but fight that urge. 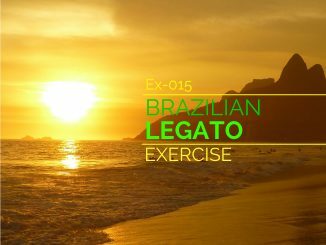 This exercise was written, notated, and recorded by Dave Dohearty.